Wedding planning can be a stressful and time-consuming experience, no matter where you plan to be married. Outdoor weddings, both ceremonies and receptions, have become increasingly popular in recent years, for a variety of reasons. Outdoor wedding ceremonies and receptions can be very beautiful, and unique, however, they often require you to think about things that you would take for granted at a traditional indoor venue. First, you’ll need to find a venue you like that will suit your needs in terms of the location, and your expected guest count. Some venues routinely host weddings and may have most of what you need. Others may have almost nothing you need and will require you provide everything necessary to make the site usable for your wedding. One of the keys to planning a successful outdoor wedding in a venue like that is to choose vendors who have experience in providing the event infrastructure needed to transform a raw outdoor space into a beautiful wedding venue. If you are working with a wedding planner who has experience with outdoor events, he or she will likely have relationships with all of the necessary vendors. If you are not working with a wedding planner, choosing the right event rental company can make your wedding planning experience much less stressful. Depending on your particular needs, the rental company you choose may be able to provide all of the equipment and services your wedding will require. If not, hopefully they will be able to provide what you need by sub-contracting some of the specialized services to reputable companies they have worked with in the past. Many event rental companies have established relationships with reliable companies that provide services they do not offer in order to provide their clients with a one-stop shopping experience. By working with lighting designers, you can have special effects lighting such as LED fixtures, pin spotting, gobos, patterns, automated fixtures, landscape lighting, etc. Special events often require significantly more electricity than what is available on site; this is especially true for larger events being held at someone’s home. In cases where the power requirements exceed the available power, you will need towable generator(s) and power distribution to get the electricity to the areas where it is needed. AV providers can supply whatever is needed for events of any size, from sound services for an outdoor wedding ceremony, to large scale video productions. They have the equipment and the technicians necessary handle any event. There are many applications where event flooring and/or carpeting may be required in order to make an event site usable. In some cases, building a level floor is the only way to create a suitable space for a tented event. There are also situations where flooring or carpeting may not be required, but having it makes the event significantly better. For example, installing turf type carpeting over a soft lawn to provide a moisture barrier may save some expensive shoes. This is definitely one detail you do not want to overlook for the comfort and convenience of your guests. A good sub-contractor should be able to offer a variety of portable restroom accommodations, including standard porta-johns, chemical flush units, VIP units with cold water sinks and flushable commodes, and elegant restroom trailers. A black tie tented event on a humid summer evening can be quite uncomfortable, especially if the tent is enclosed with sidewalls due to rain. Fortunately, portable air conditioning service is available for situations such as this. A sub-contracted AC company also has the ability to cool indoor spaces. Generally speaking, they can provide cool air anywhere it may be needed. By working with a sub-contracted experienced decorator, you can cover tent sidewalls with fabric, do elegant fabric treatments on side poles and center poles, swag fabric in the tent ceiling, etc.. Some events and applications require heavy-duty clear span structures. This is a special type of frame tent that comes in a variety of sizes to fit almost any application. Roof panels and sidewalls are generally available in solid white vinyl, or clear vinyl. Here at PartySavvy, we work with some of the best and most reliable companies in the region to help give our customers the most seamless, low-stress wedding planning experience possible. 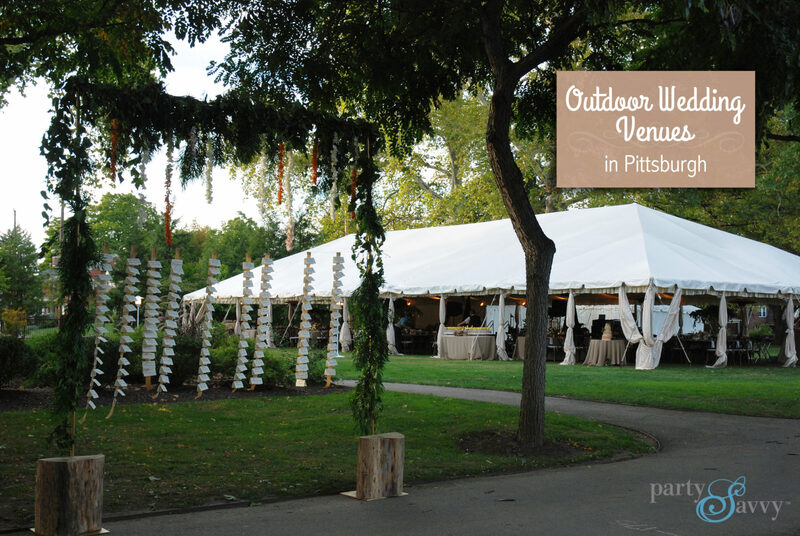 Let us help you bring your outdoor wedding vision to life.